Every October we celebrate LGBT History Month and honor the significant contributions that LGBTQ+ people have across the globe. We often hear that students don’t learn about LGBTQ+ people in school. Every year, the website LGBTHistoryMonth.com features 31 new icons, one for each day of October. There are short videos, bios, and downloadable photos that could easily be used in the classroom, a GSA meeting, or to create a display in your school. The website also archives its list of past icons, going back to 2006. 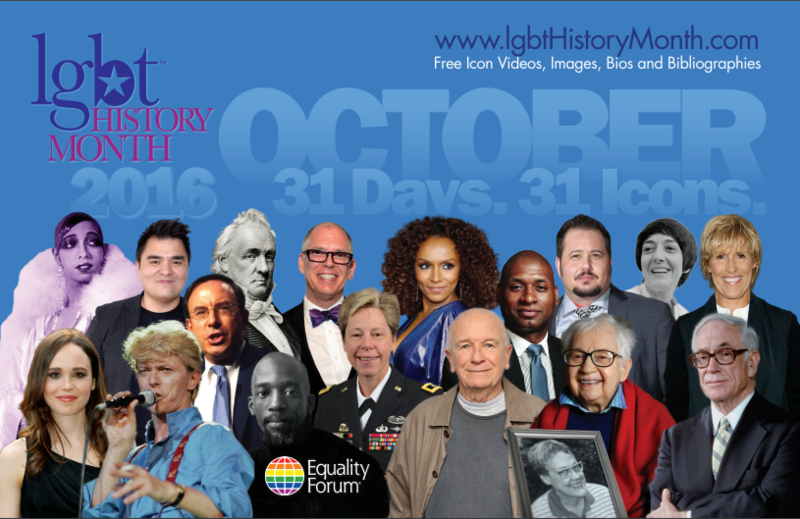 They also have a feature that you can use to search by keywords, such as “bisexual”, “scientist”, or “Asian-American.” Now in its tenth year, LGBTHistoryMonth.com has featured 310 LGBTQ+ icons! As usual, if your GSA organizes an event or creates a display around LGBT History Month, we would love to hear about it! Email photos and stories to tim@gsafewi.org and we will share with other GSAs.